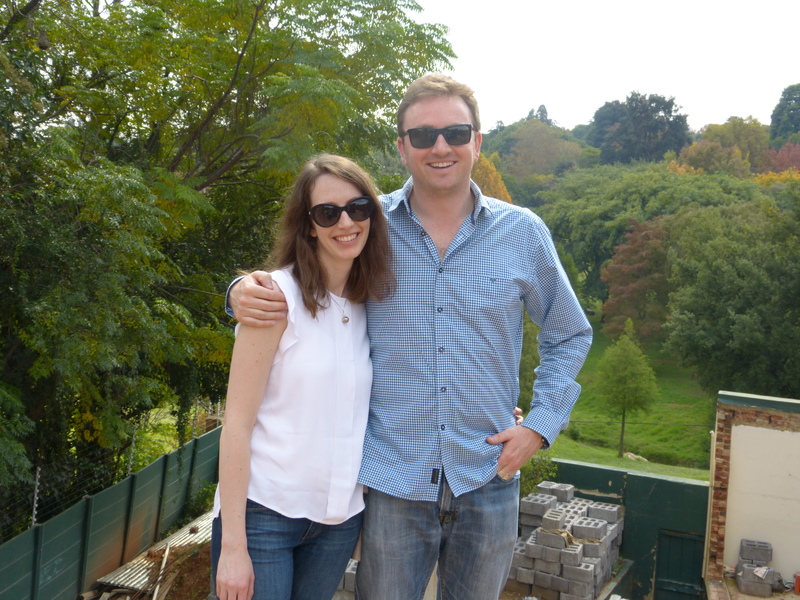 Last week our son and daughter-in-law were in Johannesburg on a visit from London and they visited the new house for the very first time. 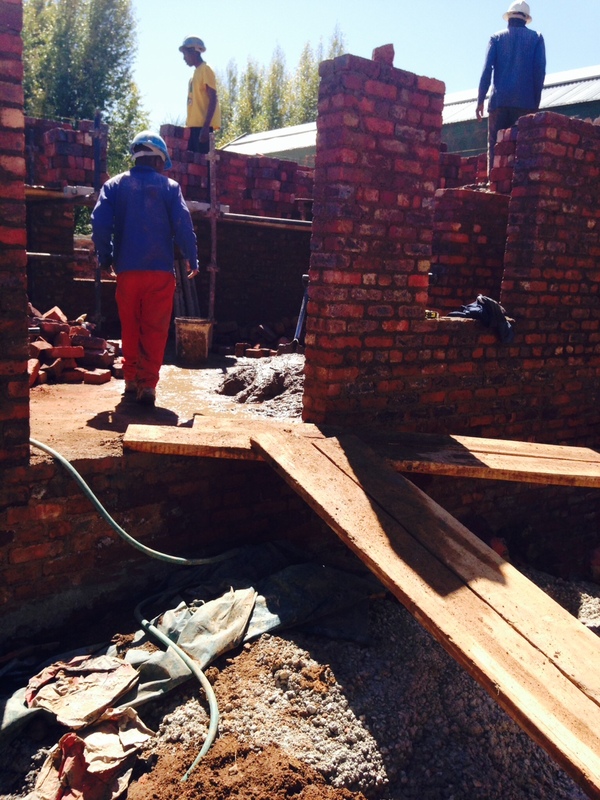 We had not realised that Greg had not been home (ie to Jhb) since before we bought the original house in October 2012, so he has really been entirely dependent on this blog for information as to what his parents are getting themselves into. It was interesting seeing his reactions and hearing his impressions. Overall, he seemed to find the house bigger than the impression he’d had from the photographs I’ve posted and generally seemed quite satisfied with what he found. I had the feeling he might have been surprised by this…. Of course, having lived in London since 2005, his perception of space is different from ours and he and Carly were quick to recognise that the cottage we’re building on the street side of our house is just about exactly the same size as the flat they have recently bought in Maida Vale. But I am the first to acknowledge that there is absolutely no point in comparing South African sizes and prices with London. A Maida Vale Mansion Block. The two aspects of the new house with the most appeal for them, are I think, the outlook over the trees in the park and the undercover veranda which will be similar in size to what we have in our present home. 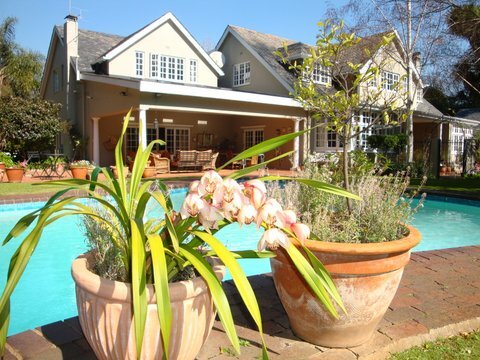 Undercover verandas have become very important areas in South African homes. Given our (usually) moderate climate, they are spaces where we spend a lot of time and are often treated more as an open-sided room than a veranda. I think too that Greg realised if he ever wants to practice golf shots while home for a few days, he will only have to go through the gate in the garden wall to be able to swing golf clubs to his heart’s content. Another discussion that came up was centred around the bathrooms. There are three en suite bathrooms upstairs. The ‘main’ bathroom was to have a bath and separate shower, the bathroom attached to the second bedroom was to have a bathtub and no shower and the third, only a shower. 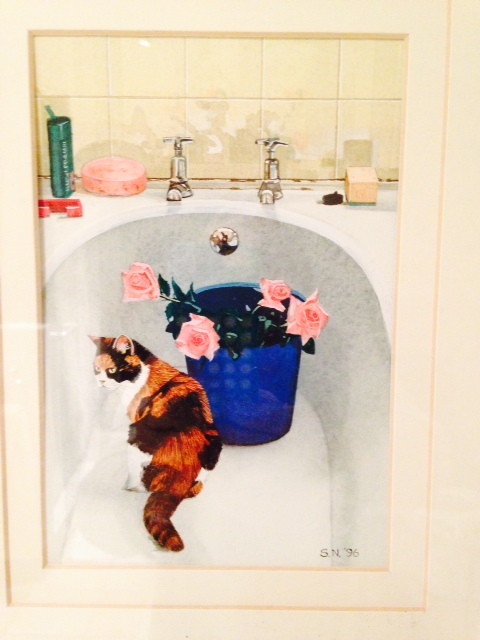 I had reservations about the second bathroom and had discussed with Bernard the option of having a shower option over the bath. He seemed resistant to this idea as being a less than ideal compromise. I was planning to have the discussion again… However, having discussed with Greg and Carly the fact that the second bedroom would probably always be first choice for guests, given that it faces the sunny north and has a lovely view, we decided that the bathroom should incorporate both a ‘tub’ and separate shower and discovered when talking to Bernard that by moving the passage wall just a few centimetres, we could achieve this. Nothing like offspring to help one revise one’s ideas…. Needless to say, the builders will have had to move a wall this week. I use the word ‘tub’ with some hesitation as it is not one we hear often in South Africa. Or in England, for that matter. It is very much an American word. In this country and in England we tend to refer to a bath tub as simply a ‘bath’. 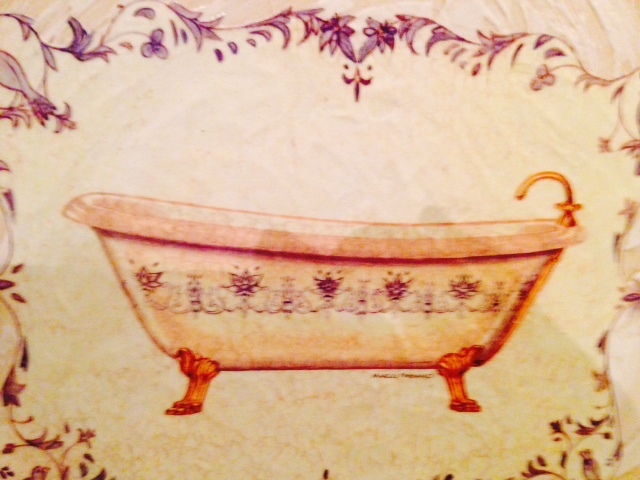 We would never say ‘she’s in the tub.’ We’d say ‘She’s in the bath’ or, ‘She’s having a bath.’ With the internet, movies, international décor magazines proliferating everywhere etc, it is becoming more acceptable here and I have to say I really love the word. There is something very satisfying about it. I think I shall start to use it! A few weeks ago I came across a whole article and debate on Houzz about the pros and cons of showers versus tubs. Showers seemed to come out on top but if you can fit in both, I think that’s still first prize. After checking out the house (in detail) we moved on to 4th Avenue Parkhurst where we had brunch at Vovo telo. Despite it’s being the Monday of the long Easter weekend, (In SA both the Friday and the Monday are holidays) all the restaurants on 4th Avenue that were open (most of them) were heaving with people. 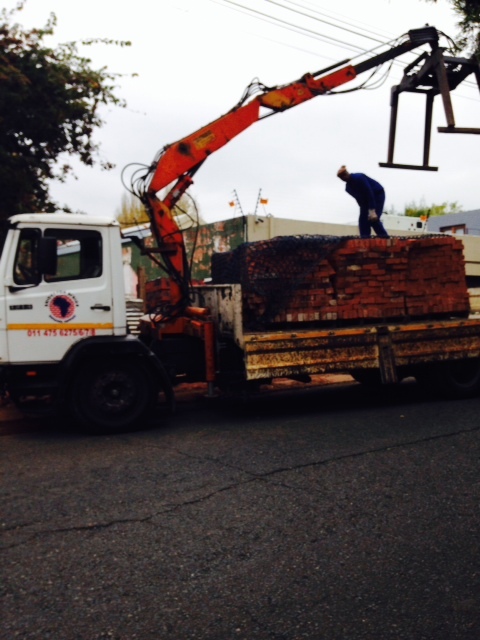 I was pleased the children were able to enjoy this aspect of Parkhurst as it’s one of the things we love about our new neighbourhood-to-be. I love the High Street feeling of 4th Avenue where little shops and restaurants still open onto the pavement and the street as opposed to being stuck inside big shopping malls. Downsizing is interesting. It elicits different reactions from different people depending on their ‘head space’; on what age or stage of life they’re at. We’ve had quite a few people express great surprise (shock, perhaps?) that we’re choosing to move from the suburb we’re in which appears to have a certain cachet, to where we’re going. Even if we want to go smaller, the implication is that perhaps we could have simply gone to a smaller house in the same suburb or a similar one. Well, we could have. We have permission to sub-divide the property on which we now live and if we were really determined to stay here we could have built a house on what is now our tennis court. And one day, someone might do just that. But we were looking for something different. Much as I love my neighbourhood, I feel as though we’ve ‘done our time’ here. 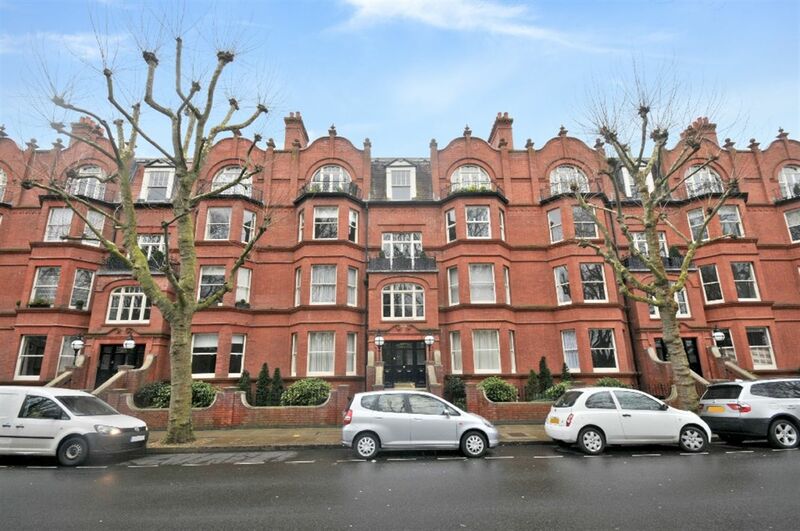 While there are still some ‘older’ people, there are also lots of new, younger families (just like we once were) with school-going children who love the bigger gardens, pools and courts and who fill up all the rooms in these rambling older homes. If I could choose the buyers of this house, I’d pick a young family just like that and I’d hope that they wouldn’t even consider building a house on the tennis court. We bought this home from a family who’d lived here 25 years and we’ve been here for 20. I think we’re only the 3rd family to have lived here. We could also have decided to move into a gated estate but we didn’t feel ready for something like that and many of them are quite far from the area in which we now live. Moving to one of them would mean changing our whole lives. 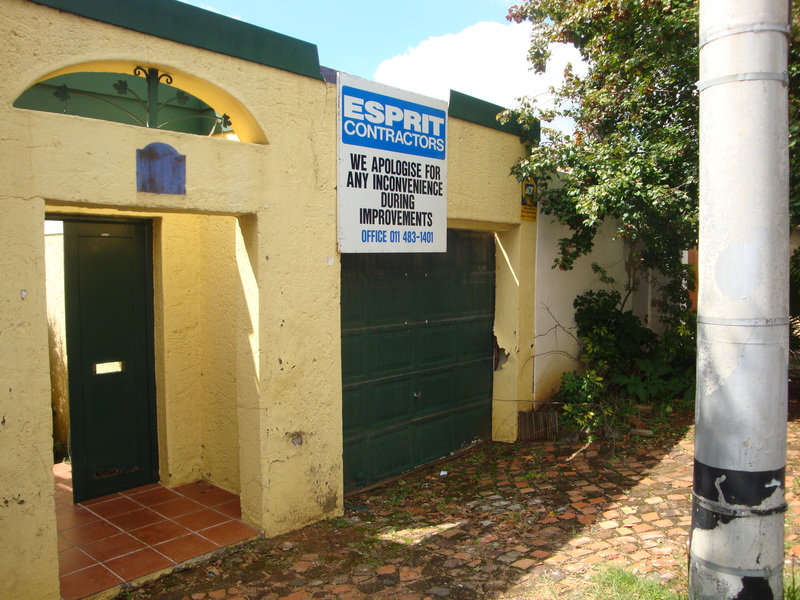 As it is, Parkhurst is a 5 minute drive away as the crow flies and 10 at the most. Although it has a completely different feel to it, it is still in the middle of my usual stamping ground. We will have the same pharmacy, the same corner shop, the same supermarket, doctor, nursery garden and most importantly, the same veterinarian. It has a more ‘urban’ feel to it and that is something we’re looking forward to. We’ll be able to walk somewhere for Sunday brunch. It seems to be a suburb for starting out and for winding down. Whenever I drive through it, I am surprised by the number of prams being pushed along the pavements; some by young parents and some by nannies. And at the same time we have several friends who started their married lives there and who have very recently moved back. We think we’re going to enjoy living there and also, we think that when our children and other family members visit from London, they’ll enjoy being there too. 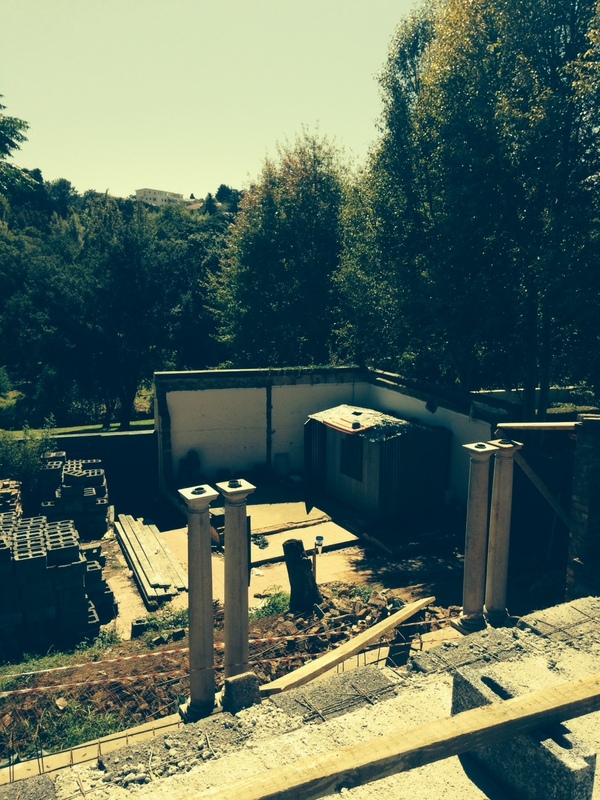 Great site meeting today with lots of progress made in a week. 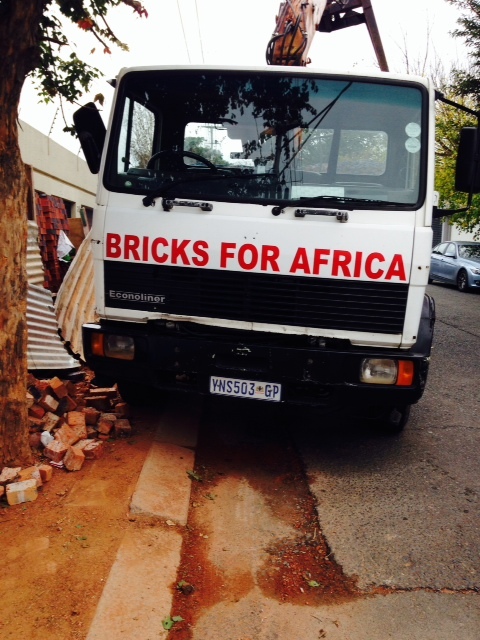 This is quite a popular slogan for businesses in South Africa. Looking at the truck this morning, I wondered whether you use this expression elsewhere in the world? It’s used for all sorts of things here when there is perceived to be plenty of something; ie” There was food for Africa at the picnic” – There was more than enough. But I don’t mean to get sidetracked into a language lesson. It works quite well here; we have ‘Sprinklers for Africa’, ‘Flowers for Africa’ etc etc. 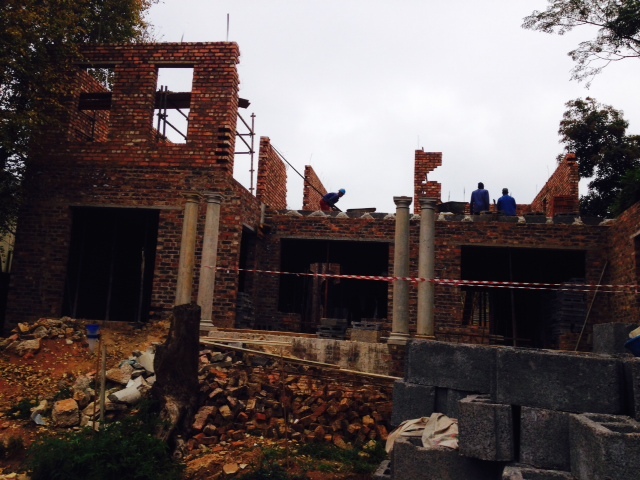 Work on the cottage is progressing quite well. 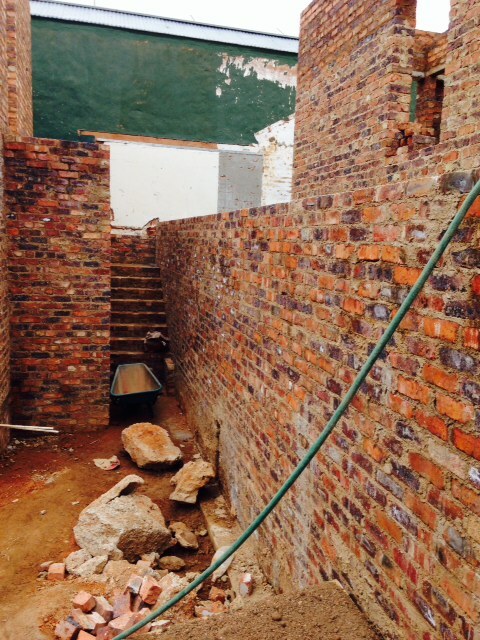 Below is a picture showing the start of the staircase which will to the left of the entrance. A compact guest toilet and basin will be going under the stairs. 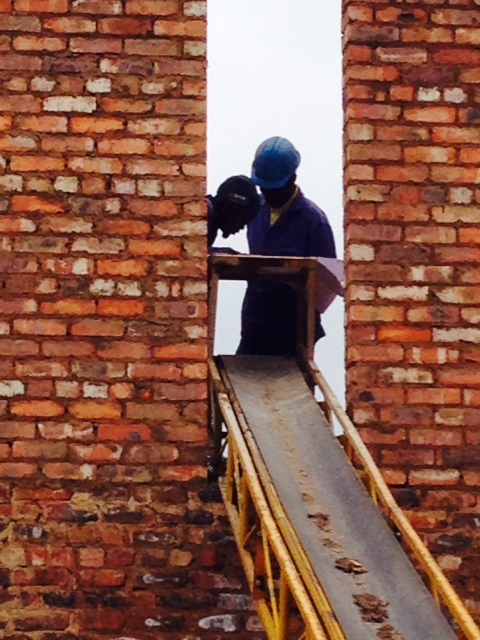 Work has started on the cottage staircase. 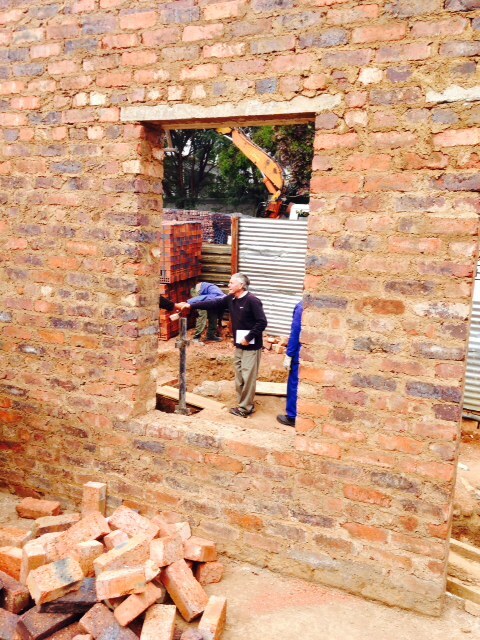 Eric, our engineer, seen through a front cottage window. Looking South from the cottage through the French doors and window openings. 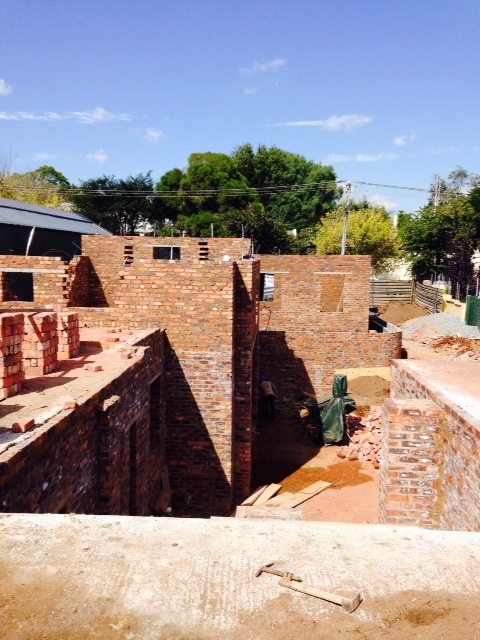 The cottage will essentially face the street although there will be windows on the northern side to let in sunlight. The road is quite busy, especially in the morning and late afternoon. Although there will be a narrow veranda and then a wall between the cottage and the pavement, we’re starting to consider double-glazing the south-facing windows. 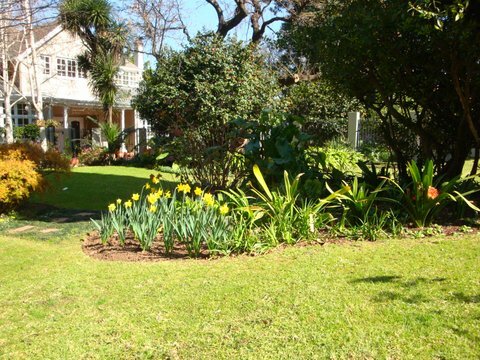 Below is a picture of the house taken from the ‘garden’. Today was the first time in a while that I’ve been able to get down to the garden level, over piles of rubble and bricks. 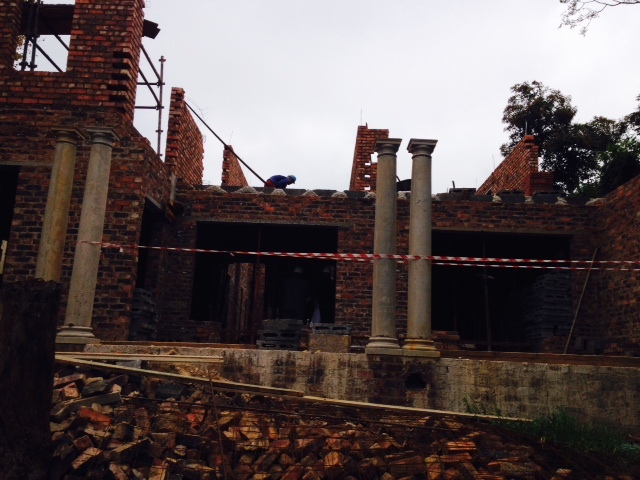 The slab above the veranda has still to be thrown and until that happens, the brickwork on the main bedroom can’t start. View of the house from the garden. 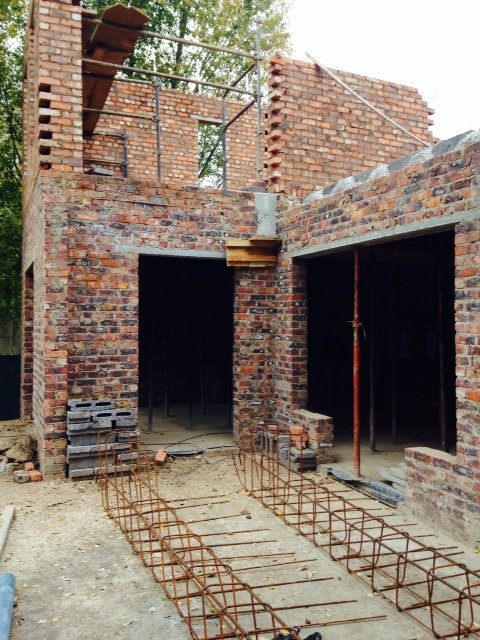 A different angle showing start of 2nd bedroom. 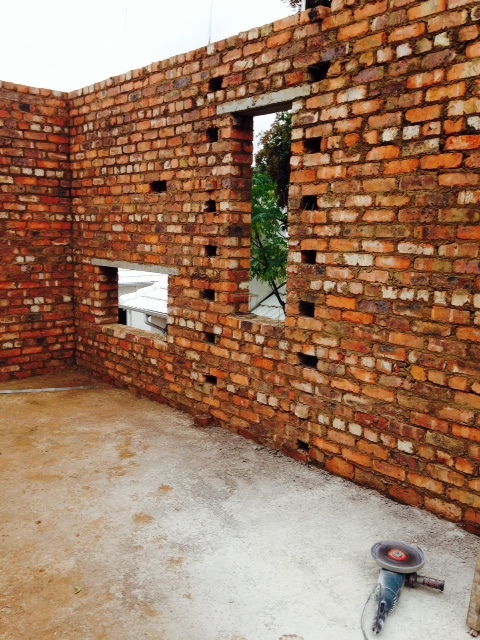 Window openings in 2nd bedroom. Looking up at the French Doors from the 2nd bedroom. This morning, looking at the depth and length of the space that will have to be filled in between the retaining walls and the cottage, we took a sudden decision to build a storeroom into it instead. Bernard thinks it’s a very good idea and Eric, the engineer seems to think is makes very good sense. More space to store garden equipment that would otherwise have had to be in the garage. 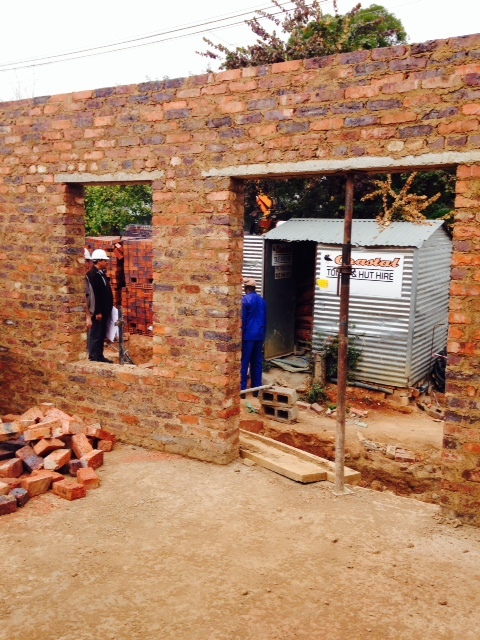 The photo below shows the wall into which a door will be knocked. 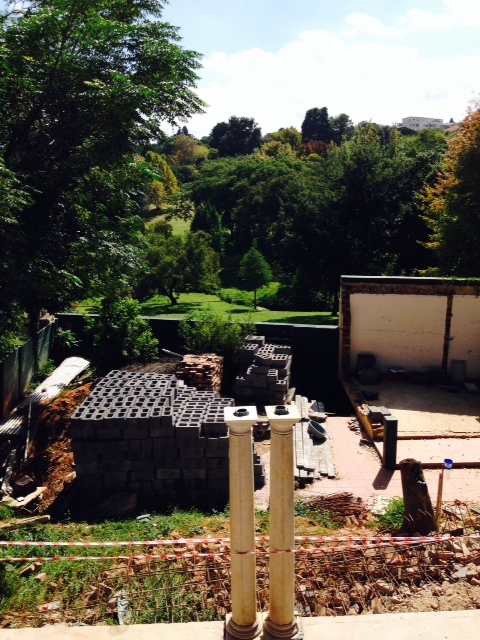 We have decided to put a door in the retaining wall on the right. 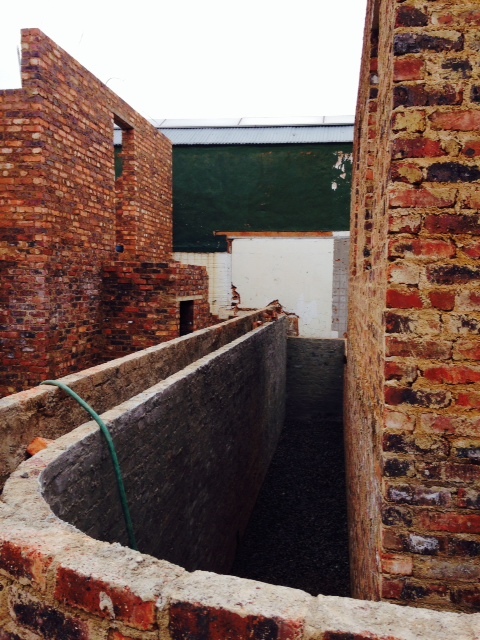 Part of this space – between the cottage and the double retaining walls – will be made into a garden storeroom. I am not a fan of windowless, cellar-type rooms so the door will have to have to be slatted or will have to include a window. 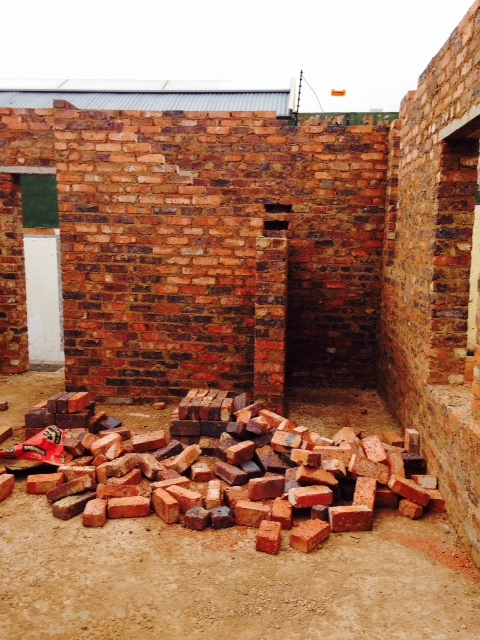 The start of the main en-suite bathroom. The low, oblong window will be next to the bath. These two guys are studying the plans intently at the top of the conveyor belt which is positioned through south-facing window of the main bathroom. It is not a floor-length window; it’s temporarily this deep to allow access now. 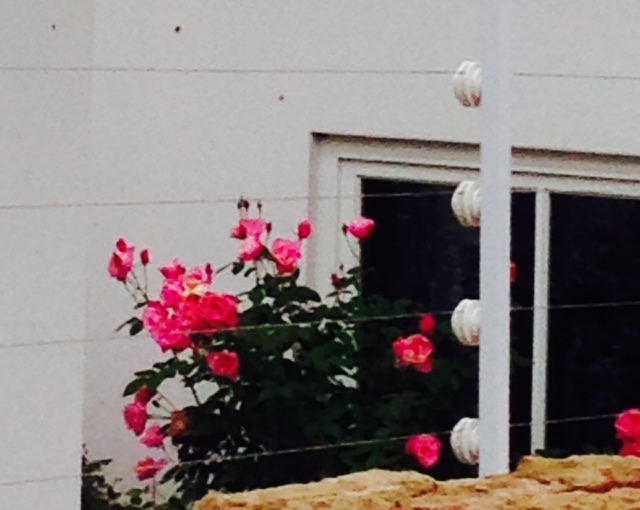 Every now and then when I’m on the site I get distracted by flashes of vivid pink; the roses in the neighbour’s courtyard. If you can see past the ubiquitous electric fencing, they make a welcome change from the rubble and brickwork on our side. Eventually, a pathway will run down between our house and this garden wall. It will provide us with access from the driveway to the garden in front of the house. 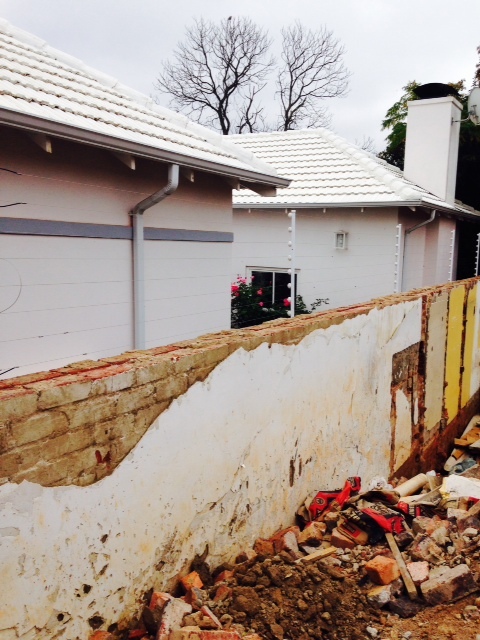 The wall itself has been put on a back burner for now as our neighbour has not been open to discussion on the subject. The yellow part of the wall on the left is paintwork still remaining from the kitchen of the original house, which was built right up to the boundary. 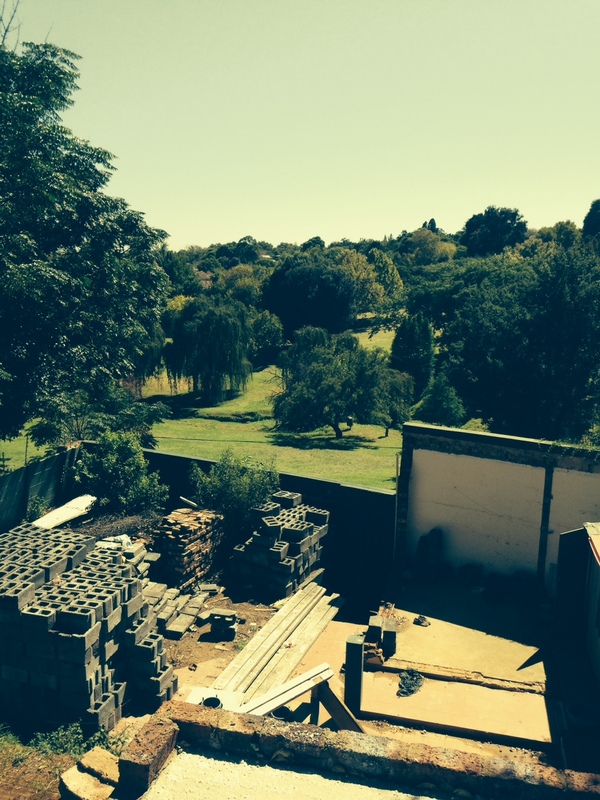 One day this walkway will be covered with jasmine and climbing roses… Watch this space. 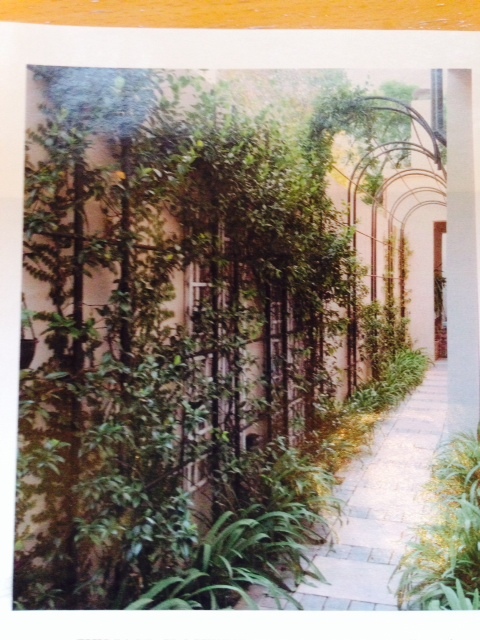 The photo above (from Garden & Home magazine, June 2013) shows a narrow walkway between a house and garden wall, similar to what we will have. Eventually, the rubble-strewn strip we have at present, will hopefully look something like this. We have made a small but significant change to the roof windows in the guest-suite above the garage and to the upstairs section of the cottage. Originally we had planned to have only opening skylights in the guest suite and while there were downstairs windows in the cottage, there were also only skylights in the upstairs section. Original plan showing Velux skylights in guest suite. The cottage has similar skylights on the northern roof face. Now that we are able to climb up to the upstairs level of the house, we are able to appreciate the outlook; not only to the north, over the park, but also to the west, over rooftops to trees beyond. We realised that to be able to actually see out of the skylights in the guest suite, you would have to stand up against them and you would not be able to see anything but sky from a sitting or lying position. We are now replacing the four west-facing skylights with two dormer windows and are adding a dormer window to the west face of the cottage roof. The plan now looks like the one below and we prefer it. 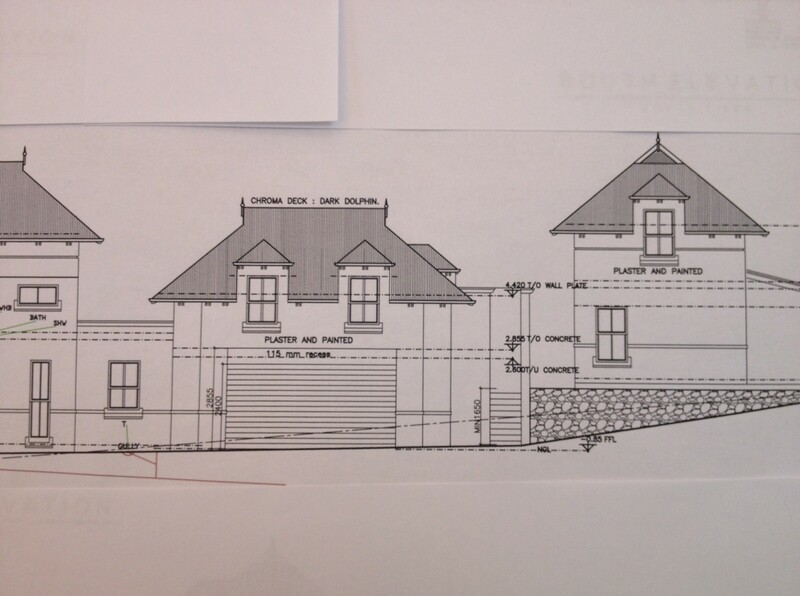 Revised plan showing two dormer windows above the garage and one facing west in the cottage roof. This elevation gives a good idea of what the house will look like when approaching from the driveway. 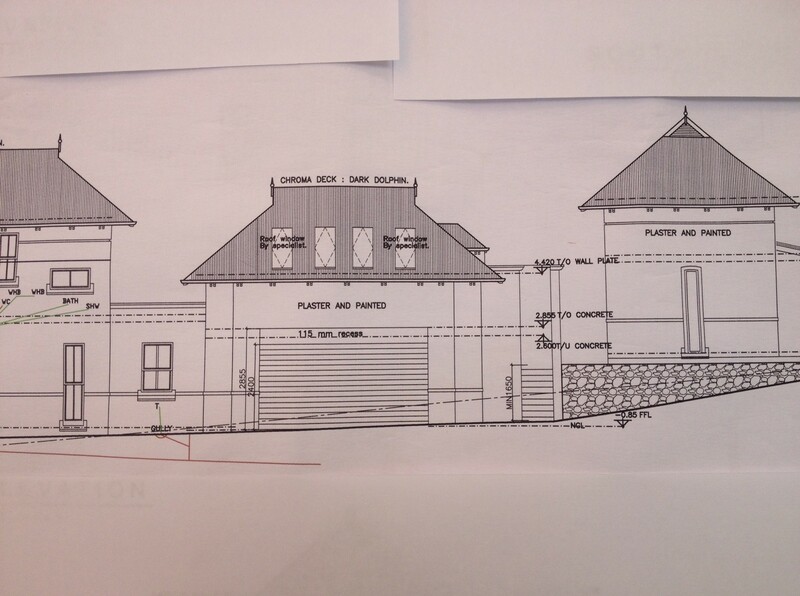 Bernard, our architect, specifically wanted different roof heights which he feels are reminiscent of clusters of farm buildings. This is the main reason why we have the flat-roofed link between the garage and main house. That ‘link’ is to be the laundry. I have always had an aversion to flat roofs because I have never known one that doesn’t eventually leak so this has been something of a compromise for me. I do, however, appreciate his reasoning and I like the way it looks. 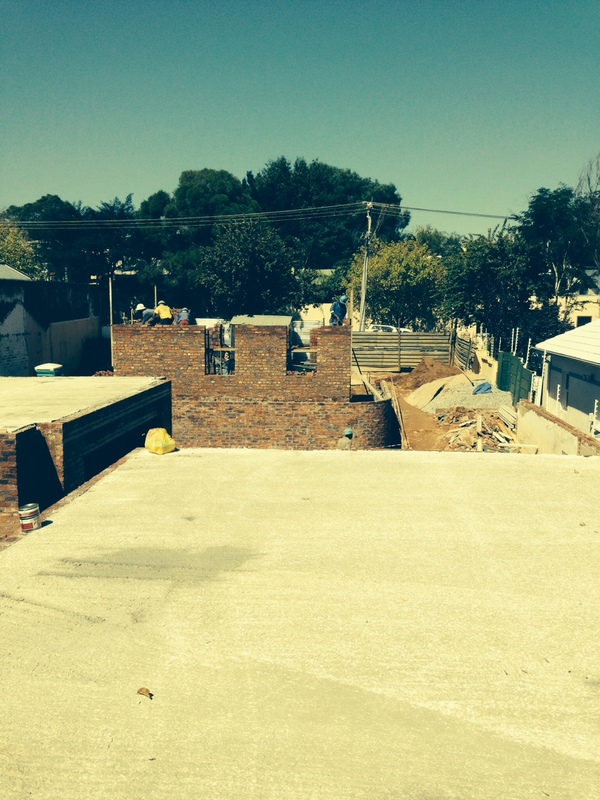 But I think I will climb up onto that roof myself when the waterproofing is done. Looking carefully at this drawing has also revealed a strange-looking upstairs window which is supposed to be a conventional sash. I’ll have to take that up at the next site meeting. I have no idea how it has come to be drawn like this. It is a west-facing sash window in the third bedroom. The only other physical changes we’ve made so far have been the moving of the door leading from the kitchen to the scullery by a few centimetres and extending one internal kitchen wall by approximately 800mm. I’m not sure but I think this is pretty good going. 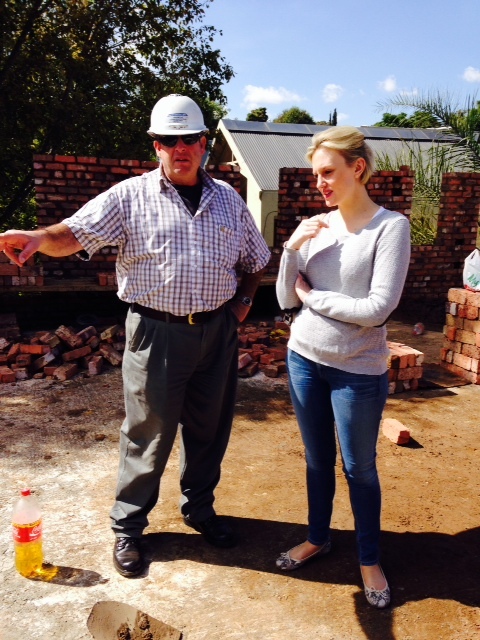 My daughter arrived home from London this morning on a short visit and came along to the site meeting with me this morning. Anyone who has a daughter will appreciate that this was an important event. Firstly, although London has been her base for the past 5 or more years, our present house where we’ve lived for the past 20 years, will always be the one she thinks of as ‘home’ and so to see it being slowly ‘dismantled’ as I steadily sift through cupboards and shelves and make plans to fit into a much smaller space is probably unsettling for her. 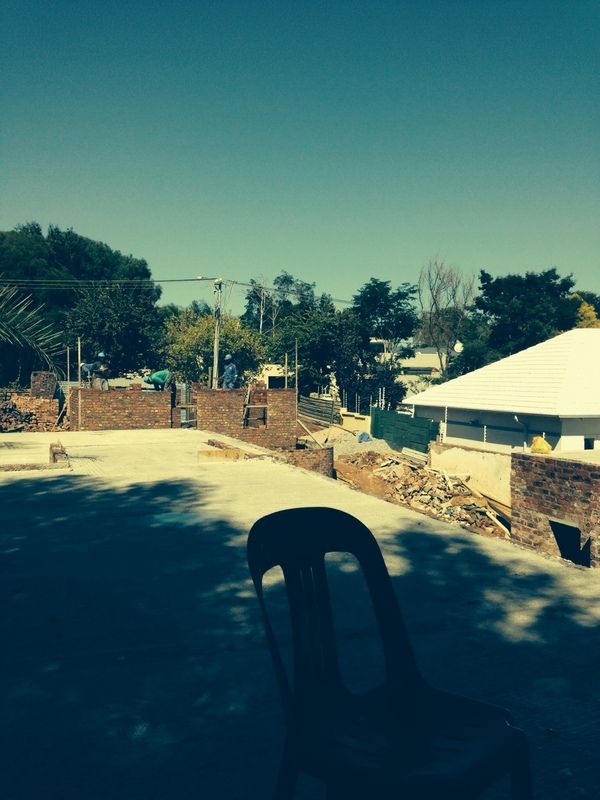 She visited the site before the previous house was demolished and I think she – along with many other friends and relations – struggled rather to envisage how we were ever going to create a new, welcoming home there. But today, with the upstairs walls going up and some of the rooms actually starting to take shape, I think she was reassured. 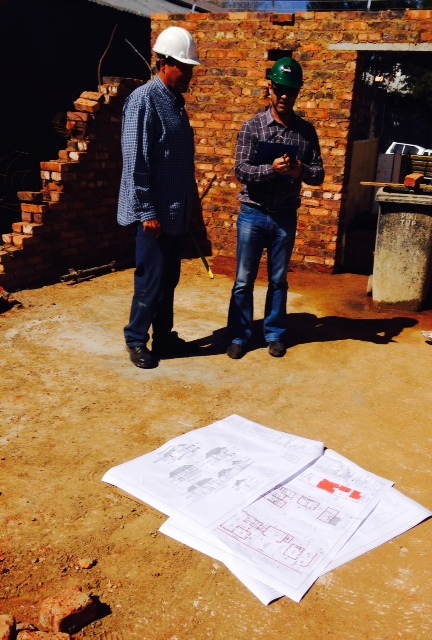 Mark (our contractor) explaining the dimensions of the patio. The conveyor belt in position. The conveyor belt is now in position and was in action today. 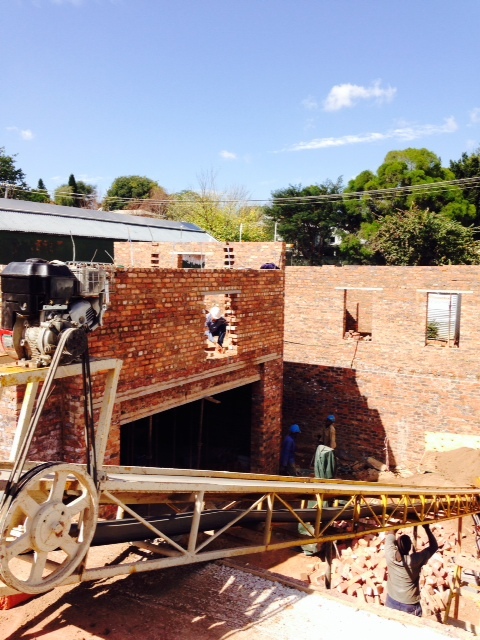 It is being used to carry building materials up to the first floor. 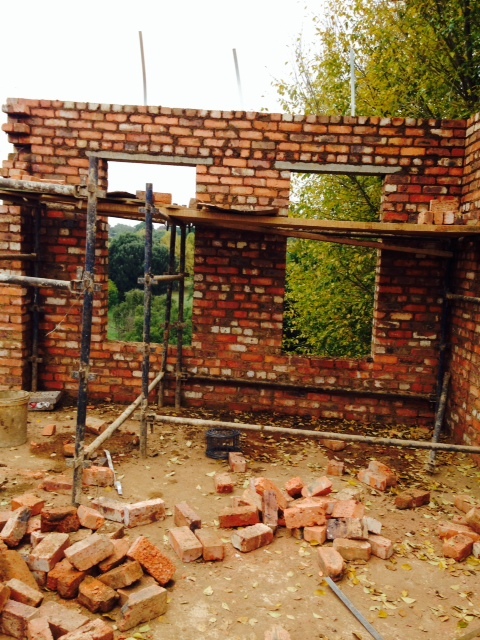 In the photograph above you can also see the openings for two north-facing windows in what will be the living room of the cottage. Above the garage is a window that has somehow made a completely unplanned appearance and no explanation was forthcoming this morning… It will have to be bricked in. While we have made a change to the window schedule for both the cottage and the guest-suite, this opening does not fit with either the original plan or the new one so someone was a little confused. We have had very few errors of this sort though and nothing that couldn’t be easily fixed. Today’s View to the North. Bernard and Rupert discussing the changes to the guest-suite windows. Standing Upstairs and Looking South towards the Street. The weather seems to have stabilised and it’s great to see measurable progress from week to week. I’ve just come home after the first sunny site meeting we’ve had in months. In fact, it’s such a beautiful day that I arrived on site to find a makeshift coffee table set up and questionable coffee on offer. How could I refuse? Looking South towards the cottage. Photo taken from what will be the 3rd upstairs bedroom in the house. The cottage, taken from the street. Looking back towards the street from where the second bedroom will be. The chair marks the morning coffee spot. And these clear African-blue skies are what we’ve been missing for the past three months. View over the park from upstairs. View from upstairs looking slightly towards the east. 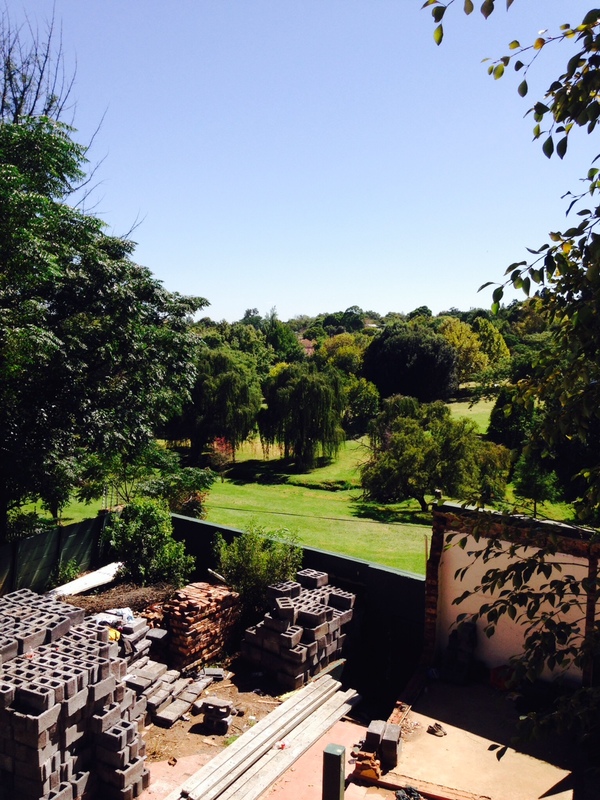 We feel very lucky to have an outlook like this from what is going to be essentially a ‘townhouse’ is a very central suburb of Johannesburg. It was this sense of space that made buying a stand of just over 800 square metres possible for us. Although our own garden will be very small and my biggest concern about downsizing is the loss of the lovely garden and beautiful trees we’ve had for the past 20 years, I’m hoping that having all these ‘borrowed’ trees will make it easier to adjust.